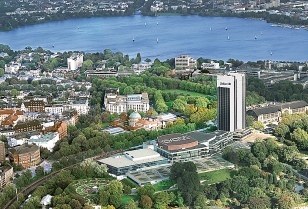 The conference venue for the ICANN 2014 is centrally located in Hamburg with easy transport links for fast and reliable travel. It is in the quarter Rotherbaum, next to the main line train station Dammtor and next to the Congress Centrum Hamburg (CCH) at the edge of Planten un Blomen park. Hamburg Airport serves 114 destinations worldwide, with direct links to 52 European cities. It is located in the north of the city, with easy connections by S-Bahn/subway, but also by airport buses, public buses and taxis. Travel time from the airport to the conference venue is about 20-30 minutes. The conference venue is directly linked with the ICE, IC and Interregio train network of the Deutsche Bahn, with its own Intercity train station Dammtor just a few steps away. If you want to reach the venue by car, please follow the signposts to Congress Centrum Hamburg (CCH). The signposts indicate the shortest route to the CCH, which has an own underground car park with 900 parking spaces. From the CCH it takes 5 minutes walking to the conference venue. There may be a fee for parking in the CCH. The conference venue is easily accessible via public transport (HVV). Taxi: Taxies in Hamburg are mostly coloured ivory and have an illuminated yellow sign on top. A ride from the airport to the conference venue costs around 25 EUR. Should you need a letter of invitation in order to obtain the required documents to attend the conference, please login into the registration system. Within this system we made visa invitation letters available for all participants with a completed registration and an accepted paper. Please contact us via ICANN2014 (at) informatik.uni-hamburg.de if you have further questions or need to specify additional necessary details. Also please note that letters of invitation do not imply any financial support.